Jeffrey Koons is well-known to artists, auction houses, and copyright enthusiasts. His works of art have fetched substantial sums of money, including one that recently sold for more than $58 million—the most expensive work of art by a living artist sold at auction. Some of Mr. Koons’ works also wind up being exhibited in federal courtrooms as he has been the target in a string of copyright infringement suits. For example, Rogers v. Koons—a case involving Mr. Koons’ “String of Puppies” sculpture—is one of the leading decisions on the fair use defense of parody. The original “Puppies” photo and the “String of Puppies” sculpture. He lost that case, but later rebounded with a victory years later in another copyright infringement lawsuit, Blanch v. Koons. There, Mr. Koons’ painting allegedly infringed on a photograph of a woman bedecked in “glittery Gucci sandals.” The Second Circuit sided with Mr. Koons and found his incorporation of the original work in his painting was sufficiently “transformative” such that he had not infringed Ms. Blanch’s copyright. Koon’s painting montage was found to be a “fair use” in Blanch v. Koons. 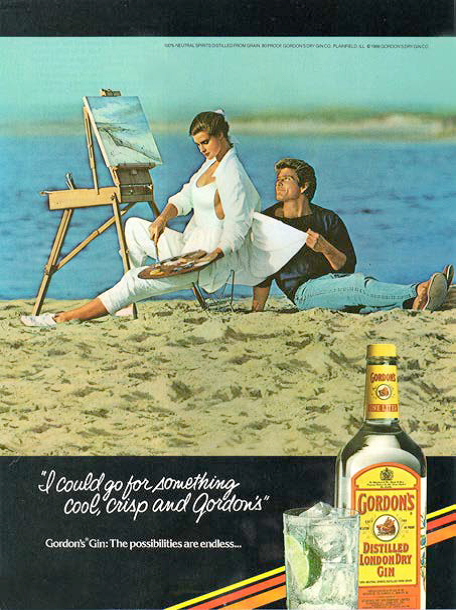 Original Gordon’s ad from 1980s. Koons’ painting from “Luxury and Degradation” series. Mr. Gray is bringing the case now because he allegedly just discovered the infringement in July 2015. As The New Yorker observed, “Luxury and Degradation” included reproductions of several “liquor-advertising posters in seductively intensified colors.” Other liquor company ads by Bacardi, Dewers, and Frangelico were also reproduced in the “Luxury and Degradation” series. One of the photos at issue in Cariou v. Prince. 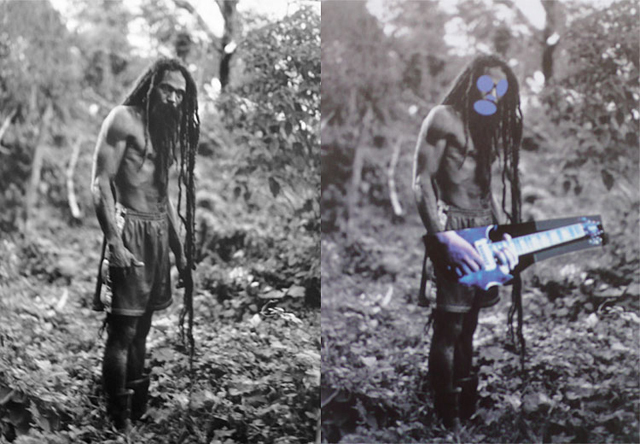 The 2nd Circuit found several of the allegedly- infringing photos were protected by fair use. So, if past is prologue, Mr. Koons is going to defend on the basis of fair use. Will this be a String of Puppies redux, or will he be able to side step this infringement suit? On first blush, the allegations (if true) appear to share more similarities with Rogers than Blanch. There appears to be a complete appropriation of the plaintiff’s photograph, just like there was in Rogers. And, to the extent Koons is relying on a claim of “parody” or “satire” in the present case (like he was in Rogers), it isn’t something that appears easily discernible from the work itself. Blanch, by contrast, involved a substantial transformation of the original photograph by including a portion of the photo into a painting montage. That type of transformative use does not appear to be present here. On the other hand, the Second Circuit has expanded the notion of transformation in recent cases such as Cariou v. Prince involving alleged infringement of photos and Authors Guild v. Google. Mr. Koons will likely focus on the social statements he was trying to convey in the “Luxury” series, and how those statements commented on or criticized liquor companies and their advertisements in the 1980s. Whether the Court will find that sufficient under Blanch, Cariou, and Google remains to be seen. We will be monitoring this case closely and will keep you posted here at TheTMCA.com with any newsworthy developments. Previous story When Are Jeans Made In The U.S.A.? RE: your reference to Cariou v Prince: The blue guitar photo is not an example of what that particular court deemed ok, since it was one of several sent back to district court, and never ruled on because the parties settled. So, the appeals court actually did not say that was transformative. It’s unfortunate that use of that example continues to mislead readers every time this case is written about. That said, the Cariou case was unusual and is certainly not the last word on what’s transformative/fair use/parody.It went the opposite direction of what most courts had previously said. It’s not a good great example of what’s likely to be found legal in other cases, and if Prince were not wealthy, I doubt he could’ve mounted a defense at all.